A row over women's rights to wear headscarves has broken out again in France - but this time supporters of the right of Muslim girls to cover their head in school have a new and unusual champion. Laurent Levy is the father of two teenagers - Lila, 18, and Alma, 16 - who last week were barred from the Henri Wallon lycee in the northern Paris suburb of Aubervilliers. He is a left-wing lawyer, highly articulate. And he is Jewish. "Let us say I am Jewish by Vichy rules but not by the Talmud," he told me in a cafe in Montmartre where I met him with his daughters. "Three of my grandparents were Jewish, but not the one that counts - my mother's mother. "I have a historical identity as a Jew, but not a religious one. I am atheist." Mr Levy has leapt with a passion to the defence of Lila and Alma - and of the right of all girls who wear the headscarf - to an education like everyone else. He accuses the government of using his daughters as cannon-fodder as it tests the ground ahead of a possible new law on religious insignia in schools. And he excoriates what he calls the "ayatollahs of secularism," hardliners of left and right who he says are preaching a new doctrine of intolerance - sowing the seed of even greater alienation and anger in France's high-immigration suburbs. "Three quarters of the children at their school are from immigrant families. Perhaps a half are of Muslim origin. "Saying to them that just because they practise the religion of their ancestors they are doing something ugly is a sure-fire way of creating an explosion," he said. There is such incredible rigidity, such inflexibility here. That the land of Voltaire could show such intolerance! Mr Levy's daughters received a letter from the school on 24 September telling them that the manner in which they covered their heads was "ostentatious" and incompatible with physical education lessons - so they were "forbidden to enter the establishment." They are now at home pending a full decision by the local education authority's disciplinary board - and themselves seething with fury at they way they have been treated. "It's more than anger. It is a deep sense of injustice," said Lila. "They told us we have to show the roots of our hair, the lobes of our ears and our necks. But if we do that we might as well not wear a headscarf at all - we might as well carry it in our hands." Lila and Alma began to get interested in Islam two years ago - their mother is a non-practising Algerian. About a year ago they began covering their heads, but it was only at the start of this term that the authorities took steps against them. That is probably because the issue is now at the top of the national agenda - with the centre-right government of Prime Minister Jean-Pierre Raffarin considering a law banning headscarves in schools outright. 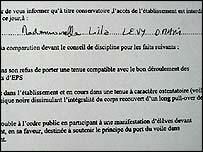 The Levys believe they were "outed" by a group of hard-left teachers at their lycee. "This is such a French story. If you came from England or Germany you would think you were on Mars. "There is such incredible rigidity, such inflexibility here. That the land of Voltaire could show such intolerance!" lamented Mr Levy. "The secularists invoke the 1905 law separating church and state. But that was supposed to stop the French republic protecting one religion - Catholicism. It was a way of opening up religious freedom for individuals - not a statement of official atheism. "The teachers at their school said to me: 'But you don't understand how painful it is for us to stand there in front of children dressed like that', to which I replied: 'So it's a tough profession - you chose it!'" he said. Mr Levy said his daughters had come under no pressure from radical Muslims, and remained as open-minded and as tolerant as they were brought up to be. "They have simply 'got God' - like so many teenagers always have, and their religion of reference happens to be Islam," he said. "It annoys me a little - the choice they have made. I think it is a mistake. I think it is a misunderstanding of the world. And I worry that the life of a woman in Islam may not lead to self-fulfilment. I say that as a father," he said. To which Alma smiled: "If it didn't allow us to fulfil ourselves, we would not have chosen it."